As does Blenheim's. Thanks for looking that up...I wonder why "oil of ginger" is distinct from "ginger flavorings"? My guess oil of ginger is actually derived from ginger. Ginger flavorings are probably manufactured flavors. In the same way that natural flavors are still manufactured, but chemicals are from nature. 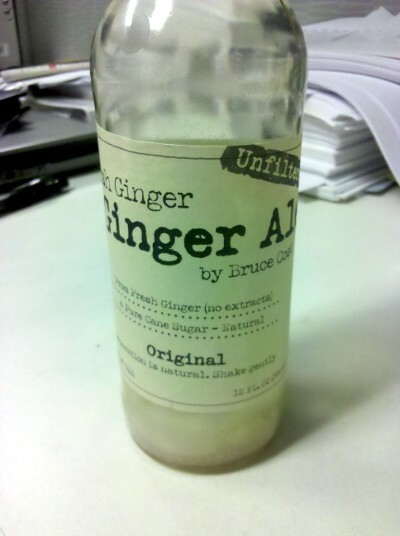 The snack shop in my building recently began carrying "Fresh Ginger, Ginger Ale by Bruce Cost." Ingredients: Carbonated water, pure cane sugar, 100% fresh ginger, and citric acid. The ginger in this stuff settles to the bottom, and it needs a gentle shake to mix it properly. This was a great find, agm! I splurged on a bottle ($2.59) at Metro Cafe off of the Virginia Square metro and it was worth it (the every once in awhile splurge) to settle my stomach down a bit. Has anyone seen it on a grocery store shelf yet? The snack shop in my building recently began carrying "Fresh Ginger, Ginger Ale by Bruce Cost." Ingredients: Carbonated water, pure cane sugar, 100% fresh ginger, and citric acid. The ginger in this stuff settles to the bottom, and it needs a gentle shake to mix it properly. I'd prefer a little less sweet, and little more heat, but it's the real deal. There is also some slight variation between bottles; I can probably get closer to what I'm looking for just by choosing a bottle with more ginger solids (solid being a loose term - I can see chunks but they're barely detectable when drinking). The photo should show the difference between the clear liquid at the top, and the ginger solids below the label. I had this in December at G Street food and agree it is very interesting; I liked it. I did a search at that time and couldn't find it in the DC area (plenty of places in NYC). Recommened pairing: Cubano (optional - ask for packets of hot sauce under the counter at the register). They carry three flavors of this (blanking on what the two besides original are) in the little convenience market across from Starbucks in the plaza at Court House metro. My building in Courthouse (1320 N. Veitch) also has two flavors of it - regular and pomegranate with hibiscus. $2.49 or $2.59 a bottle there. Are there any places in town that sell ginger beer by the growler like at Rachel's Ginger Beer in Seattle (which does ship nationally, but at a hefty price)? We were out there last month and I polished off two 64 ounce growlers (one regular, one blood orange) in a week...it was that good! Andrew, the bartender at Dino's Grotto, produces ginger beer locally. You may try contacting him at Dino's. I've decided that Fever Tree Ginger Beer is my favorite. I can't stand any ginger beer that uses fruit juice for sweetness. I would think that the first problem would be finding a ginger beer anything like Rachel’s to begin with. Her varieties are flavorful, but also very atypically dry.